Originally Crown Land, the area now known as the Anzac Rifle Range had at least twelve targets in use in 1888 and was briefly considered for the Centenary Open Championships. By 1900 Long Bay Road extended as far as the rifle range with a rail service arriving in 1902. On 21 December 1910 the New South Wales Government declared that the land was to be used for military purposes and it was used for musketry practice during World War One. It soon became clear that a more permanent rifle range was needed and a survey of the land was undertaken in August 1919. During the Depression years local residents used the Rifle Range as a gambling venue. The range remained under military jurisdiction until 1988 when the Federal Government decided to halt all military exercises at Malabar. Control of the range was given to the Department of Administrative Services while the possible closure of the range was negotiated. In 1967 many rifle clubs, including the National Rifle Association, transferred to Long Bay after the closure of the Anzac Rifle Range at Liverpool. In 1970 the name was changed from Long Bay/ Malabar Rifle Range to Anzac Rifle Range. Since 1986 there has been increasing efforts from the Federal Government to close the Range. Successful lobbying has so far prevented this from happening. In 1998 Federal funding was allocated for the building of a new state of the art rifle range at Holsworthy. An agreement was negotiated with the gun clubs to stay at the Malabar site until 2001. In 1987 approximately 80 hectares of the range was entered in the Register of the National Estate due to the natural vegetation present. There are two pockets of coastal heath and scrub land, home to more than 60 native species. There were groups lobbying the government to make the site a national park, as it is one of the few places where Eastern Banksia grows. Though the NSW Office of Environment and Heritage stated the range is “unlikely to be reserved as a national park due to its low conservation value”. Barrett House was the home of cinema pioneers Franklyn and Mabel Barrett. In this home between 1919 and 1926, 15 silent pictures were developed, printed and edited including Australian classics "The Breaking of the Drought" and " A Girl of the Bush". When she celebrated her 92 birthday in the house in 1999, Todds Barrett was surrounded by her sepia prints depicting scenes from Australia's earliest movies. Nearby was the huge oak table her father used to cut his film. Barrett House was bequeathed to Randwick City Council by Harrie Marett (also known by her stage name "Todds" Barrett.) The house has been developed as a Sustainable Demonstration House, incorporating display material dedicated to Franklyn Barrett and Australia's early film industry. Barrett House is listed as a heritage item under Randwick Local Environmental Plan 1998 (Consolidation). Its heritage significance largely derives from the early Australian cinematography that was developed and edited in the building. The remains of this burial ground date back to as early as 1881. The Coast Hospital, later known as Prince Henry Hospital started as a quarantine hospital during an outbreak of smallpox in Sydney. 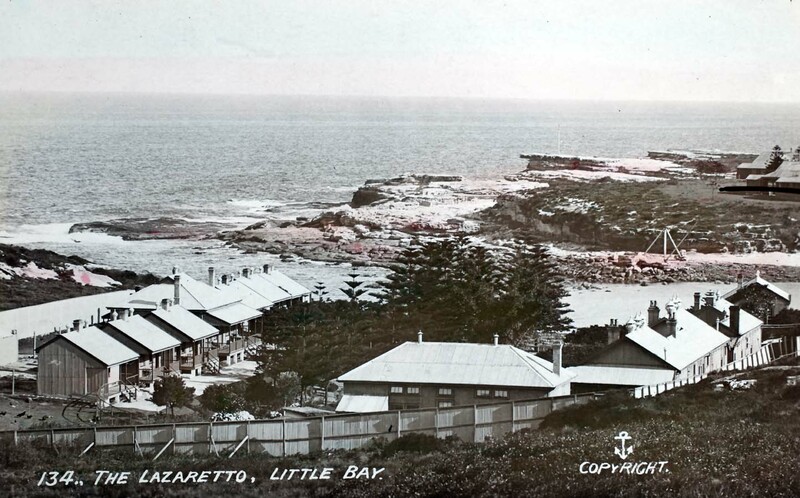 The Lazaretto, Little Bay [nd]. Postcard Courtesy Joseph Waugh Collection. Randwick City Library Service. It became an infectious diseases hospital treating leprosy, bubonic plague, influenza, tuberculosis and other infectious conditions. The cemetery also contains the graves of Chinese and Aboriginal people who either passed away at the Aboriginal reserve at la Perouse or at the hospital. Hospital staff were also buried at the site. A published index of burials at the Little Bay cemetery 1881-1952 is available in the local studies collection, Bowen Library. Further historical information about the cemetery and hospital is available at the Prince Henry Nursing and Medical Museum. Curby, Pauline. Randwick. Randwick City Council. Randwick and District Historical Society. A Randwick Ramble. Scudder, Nathan. A History of the Anzac Rifle Range. Randwick Borough Council meets for the first time in the Randwick Destitute Children's Asylum, opposite High Cross Park now part of Prince of Wales Hospital. Simeon Henry Pearce elected first Mayor of Randwick. The Pearce family emigrated from Randwick, Gloucestershire England. This is the origin of our name. The Pearce Dynasty became market gardeners and pioneers of this part of Sydney. Randwick Borough Chambers built. Designed by architect Thomas Rowe who also designed the Great Sydney Synagogue. Randwick Council Chambers, Council meetings held here. Now part of the St Jude's complex. Architects Blackmann and Parkes call for building tenders for a new Town Hall at Randwick, fronting Avoca Street. Built by contractor RG Keats. Randwick Town Hall opens, 3rd February 1882, Mayor of Randwick, John See MLA who resided at 'Urara' in Milford Street Randwick. Public gardens dedicated behind the Town Hall later taken over by the Tramway network. Alderman Simeon Pearce submitted a plan to Council to add two wings to the town hall to accommodate the Randwick School of Arts and to provide accommodation for the Randwick Town Clerk and Engineer. Randwick Volunteer Fire Brigade at the Randwick Town Hall. Architect John Kirkpatrick submitted extensive renovation plans to Council. It was decided to only proceed with the new staircase to the Council Chambers on level one. The original Borough Chambers sold to St Jude's Church. Today It is still an iconic part of the St Jude's complex, serving as administrative offices. Extensive renovations included a "ladies retiring room". 13 June: Banquet in honour of Sir David Storey MLA held at Randwick Town Hall. Randwick Municipal Council celebrates 50 years of incorporation with the publication of a small history Randwick and a commemorative medallion. A public meeting was held on 21 November to consider relocation of the Town Hall. Several meetings later and after the realisation that Council would need to raise a £50000 loan the idea was dropped. Illuminated addresses were presented to prominent local residents and Councillors (aldermen as they were then known) on their retirement from service. This address was presented on the occasion of Mayor Gilderthorp's retirement and includes a photograph of the Randwick Town Hall to help denote his Council service. Randwick Town Hall becomes an emergency depot during the Influenza pandemic. It served as an official station for the Department of Health and Red Cross services. 26 February: the Mayor of Randwick unveils a WW1 'trophy' outside the Town Hall. A German Howitzer gun. October: calls by Mayor Tressider revived the idea of relocating the Town Hall as he suggested the building should be acquired by the Randwick Public School. Mayor Jennings suggests a new town hall needed to reflect the growth in population and wealth in Randwick municipality since the Town Hall was first built. It was suggested that the building was too small and damp. The hardship of the great depression caused Council to reconsider any grand plans for relocation and instead hold an architectural competition for refurbishment. April: Invitations called for refurbishment competition. July: Council was taking steps to acquire 23-25 Cook Street for a new Council Chambers. This too came to nothing. March: Council committee formed to subdivide the town hall with more accommodation, lavatories, lunch room and record keeping areas. January: Architects Scott, Green & Scott along with Alexander Monkoff undertook works believed to include remodelling the town hall and possible relocation of the Council Chambers. Randwick Municipal Council Chamber as it was remodelled with custom built furniture. During WW11 civil defence of the municipality was headquartered in a special building adjacent to the town hall. Randwick Council spent £3456 on the National Emergency Services and £1300 on Air Raid precautions. The Japanese midget submarine attack on Sydney Harbour in 1942 justified the expenditure on civil defence at the time. During the war residents of Randwick were not immune to food and clothing rationing. Many local residents were tireless fundraisers for the war effort. At the end of WWII service personnel and voluntary workers were commemorated on glass engraved doors at the entrance. September: A temporary building to house 3000 books next to the town hall was mooted. 29 June: Lionel Bowen unveils the foundation stone for the first free public library in Randwick next to the Randwick Town Hall. 12 July Library opens It was eventually relocated to the Royal Randwick Shopping Centre in 1990. Renewed call to relocate the Town hall eventuated in a program of alterations and additions to the Frances Street side of the building. Kenneth B Spain and associates were the chosen architects and the contracted builder Allan Blyth. Foundation stone for these alterations was laid by Mayor Popplewell 14 November 1956. The upgraded Town hall was officially opened by Mayor Lucas at a Mayoral ball 29 June 1957. Over 500 people attended the function. New facilities included a supper room, cloakroom, lavatories and accommodation for all of Council's staff in one location. The Council Chamber was relocated to the southern side of the ground floor in the original building. Citizenship Ceremony at Randwick Town Hall. Greek Migrant Matoula Jackas is pictured with the Mayor of Randwick Alderman Bill Lucas (right) and Council officer Harry Shakespeare (NAA). Randwick Municipal Council celebrates 100 years with a program of events including lavish functions at the Town Hall hosted by the Mayor AC (Charlie) Molloy. The publication of the first extensive history of the area and a grand parade of floats were some of the many highlights of a year packed with festivities. A new Town Hall is back on the Council agenda by 1966 an architect was appointment who recommended relocation of Council offices to Maroubra Junction. By 1968 a change in Council prevented any action. Warren Samut & partners were appointed to design alterations to the existing buildings and a major extension to the west along Frances Street. Completed additions opened on 22 April refurbishments on the Town Hall itself accommodated the Randwick Branch Library. The modifications incorporated the "Lodge Room". Office areas on the first floor 1950s addition were converted into a new Council Chamber with ancillary space. "The most outstanding new feature of the new council chamber is the new round centred ceiling directly above the council table". An additional storey was constructed on to Administration building. Randwick Credit Union operates in the Malabar Room to the immediate left of the Town Hall main entry. Randwick Branch Library removed from the Town Hall to a new location in Royal Randwick Shopping Centre. Randwick and District Historical Society occupy the ground floor rooms on the north side of the Town hall before moving to the Bowen Library in 2006/7. Randwick City Council celebrates 150 years of incorporation with a year long program of events and the publication of a new history of Randwick by Pauline Curby. Heritage Management Plan prepared for Randwick Town Hall. Randwick Town Hall has always been a social hub for the district throughout its rich and colourful history, many local events have been held in this venue.